We know the secrets of knitting, purling, and yarn-overs, but what other mysteries lie within the realm of knitting? Here are 10 mind blowing facts that you won’t believe. Knitting is thought to be older than crochet, but younger than weaving. Archaeologists have difficulty determining when knitting first appeared due to the unfortunate fact that knitted fabrics tend to decay with time. Sharpened sticks that are found at dig sites might be knitting needles, or they might be tools used for completely different things. The English word for ”knitting” didn’t appear until the 14th century, and the craft was thought to have originated in the Middle East and brought west by the Crusades. Nålebinding (Danish for ”binding with a needle”) only uses one needle to create this fabric which is almost indistinguishable from knitted fabric. This technique is like a hybrid of crochet and knitting, where the thread is pulled all the way through a loop, instead of having a working end in crochet. Because of this, the pieces need to be seamed together as a seamless piece of fabric is impossible. Isn’t it interesting how society changes? A craft that’s generally thought of as being ”women’s work” was once a predominately male trade. The first knitting union was founded in Paris in 1527, and you guessed it – no women allowed! Invented by an English clergyman by the name of William Lee during the reign of Elizabeth I, the knitting machine changed the way we think about clothing and fabric. The business of making clothing transferred into small cottage industries, making hand knitting non-essential, a leisure activity. In many countries, the women who were left behind in times of war were tasked with picking up where the men left off. Their jobs included making aircrafts, weapons, farming, and more; they were also charged with the duty to knit socks, hats, and scarves for the soldiers that were stationed in cold places. Some families sent knitted garments straight to their soldiers, but many knit for any and all soldiers who needed a bit of warmth. Again and again, studies have proved that knitting reduces blood pressure, decreases heart rate, and has innumerable benefits for mental health as a whole. Knitting spurs a relaxation response by the body, which can help deter illness. Curious? Click here to read more about how knitting is good for your mental health. During the days of early knitting, wool was far from the most popular fiber to knit with – this is likely due to the lack of availability of wool outside of agricultural areas. Cotton and silk were the most popular among knitters for the first 400 – 500 years of the craft’s existence. Eventually wool became the reigning queen of the kit world, and wool farmers began to breed sheep specifically for sustainable, strong, and soft wool, like with the Merino sheep breed. The 21st century has seen a huge resurgence in plant based fibers like bamboo, linen, and cotton. Published in 1611 by Johann Siebmacher, this book contains 126 pages of needlework and colorwork charts, ranging from simple repeating motifs to full, tapestry-like scenes. The graphs on many pages were painstakingly filled in by hand! Love patterns? Click here to see our huge library! These early needles were designed to be strong and pointed to facilitate knitting, but used materials that we might think are very strange. Today’s needles can be made with a huge range of materials, from plastic, to aluminum, to bamboo, to beautifully colored wood. Click here to learn more about what knitting needles are made of! Precursors to knitting, spinning and weaving are mentioned throughout oral history. One of the most well known tales is that of Arachnae, a mortal woman who was very gifted in the art of weaving (or spinning, as some versions say). She foolishly challenged the jealous goddess Athena, and after they competed, Athena cursed Arachnae with melancholy. After a time, Arachnae decided that life was too much to bear – but Athena took pity on her and let her live as a spider, so as to weave the rest of her days. Arachnae is where we get the scientific term for spider, arachnid! I’m sure many or us have a fear of these creatures, which would be called arachnophobia. Don’t let your fellow knitters miss out – share this post using the social bar on the left! Stay tuned to this blog for more knitting fun, inspiration, and tips – subscribe to our newsletter by clicking here. I didn’t know a lot of this either. Thanks for the history lesson! All good things to know. Thank you! I love the blog post. As a nalbinder, you might want to know that ‘seamless’ articles are possible. Hats especially. What happens because of the fact that you use short lengths of yarn is that you have lots and lots of joins. Check out http://www.en.neulakintaat.fi/ She has great videos and projects. Interesting link. Very detailed website and interesting history. Thanks for that interesting tidbit! as a child during World War 2 at school we were not allowed to sit idle during a reading lesson, we had to knit socks on 4 needles, scarfs or balaclava on very dreary khaki wool for the soldiers. I didn’t know this stuff at all. In 1608 in the little island of Jersey in the Channel Islands, UK, knitting was banned during August and September as it had become so popular and profitable that there were not enough labourers at harvest time and the crops were left in the fields to rot. The law still stands, so if you come to visit our beautiful little island in the summer and you are a man, DON’T BRING YOUR KNITTING or woe betide you!! Seriously? Is it really enforced today? I don’t feel so bad now because as a teenage boy travelling 1hour each way to secondary School I knitted a pullover in the school colours on the bus. The other regular passengers become to see me knitting away if I was able sit. Also my father was quite good knitter making socks in the evening . I learned a lot today. I’m glad your spot was on Facebook today. So interesting. Thanks for the fun facts. Move over boys…we girls are taking knitting by storm! What an interesting blog this is, and I thank you for the opportunity to learn new things. Gonna share with my gal friends. 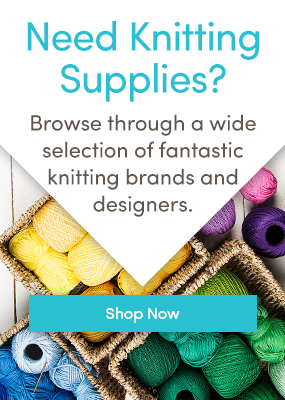 I just love Loveknitting.com! How interesting! Thank you. some new facts for me to share. That is very interesting reading. Both my grandfathers knitted their own socks, and they were beautifully made on four needles. Their knitting was neater than mine. With regard to men only knitting, there are some beautiful examples of knitter apprentice work at the Victoria and Albert museum. Not sure if these are still on public display you would have to check prior to a visit. An apprentice was required to produce a pair of gloves – and a bedspread. These are very complicated intarsia designs similar to tapestry hangings. My Granddad & Dad spun super fine yarn, my Nana (Dad’s Mum) was always seen with some knitting on the go, my Mum is the crochet person and I knit. I have just loved linking into other yarn websites from this blog, found out heaps more. Yarn is beneficial to health I reckon. Nålebinding (#2) is more like sewing or embroidery than anything else – think rows and rows of buttonhole stitch (and variations therof). It’s certainly easy to do seamless pieces with it; you just shape as you go, much like crochet. Very portable too, and wont unravel when you drop your hook! Someone on sparkpeople.com on the Raverly.com team posted a link to your site. This is so interesting. Thanks for the research. When I visited Peu a few years ago it was the men, mostly younger ones, who were knitting while standing in their shops in the markets. They made very intricately patterened “Chullos” the hats with earflaps, using fine yarn and didn’t seem to be following any instructions! http://www.freshstitches.com/knook-knitting-with-a-crochet-hook-wort/, it must be something quite similar don’t you think? Thank you for all the information. In addition to knitting compulsively I am a history nut. Thanks for combining the two. Number 2 is not correct. I make seamless things all the time in the Coptic/Tarim stitch, which is the stitch shown for the nalbinding. I’ve made this particular sock several times–no seaming involved. You do have to splice or wet-splice your yarns together, or, in the case of cotton and silk, weave the ends in, but still no seaming….. Otherwise this is a cool article! Darn near accurate on everything. However, knitting was a male only occupation in Renaissance England an France, where guilds took over. Everywhere else, it was used to keep idle women busy. Naalbinding, in my experience, doesn’t look like knitting with the exceptions of the Coptic stitch and Asle Weaver stitch (it looks a lot like herringbone stitch). Other stitches like the Dalby, are very easy to spot. And, the yarn is grafted together in spit splices, with absolutely no seams. Great shot of the Coptic socks though. Also, early needles were made in metal. The Egyptian children’s socks found dating to the 800s were 20 stitches to the inch. Bone and other materials are too brittle to work down to gauges smaller, and lengthy past maybe a US 1. They aren’t forgiving to hand pressure. I agree with my fellow nålbinders – you should update that passage about “seaming necessary”, because that’s just not true. In fact, working in the round is the easiest way in nålbindning. Working flat poses a bit of a challenge (but it is possible). And only that particular stitch (Coptic) looks anything close to knitting… Interesting post none the less. I guess we are never to old to learn. I have started to teach myself the Oslo stitch. Not too hard. But I can’t undstand how someone can turn out a sock so fast!!! WOW = WOW Very Interesting and Informative. Well written and appreciated. Thank you for the information. I did not know this. VERY interesting article – will post to my knitting friends. ? Very interesting , can any one tell me why I can knit now with square needles, & haven’t been able to knit for four years because of arthritis in my fingers??? I am a returned knitter that is sooooooo happy. Hi Saundra – if you click here, you can see the different types of KnitPro Cubics needles – circular, straight, and double pointed. I hope that helps!